Launched in 2006 in Brazil, where, from the 1970s onwards, alcohol (ethanol) derived from sugar cane was widely used as a fuel, the TetraFuel® system from Magneti Marelli, FIAT Group, enables a car’s engine to run on four different types of fuel. This allows consumers to choose whether to refuel with petrol, alcohol/petrol (a blend of petrol and 22% alcohol), pure alcohol or compressed natural gas. The vehicle is fitted with two tanks, one for liquid fuels (alcohol, petrol or a blend of alcohol and petrol), and the other for compressed natural gas. TetraFuel® automatically selects the fuel according to driving requirements, which optimises the relationship between performance, fuel economy and low emission of exhaust gas. Ethanol combustion is less polluting than petrol and gives the engine added power. 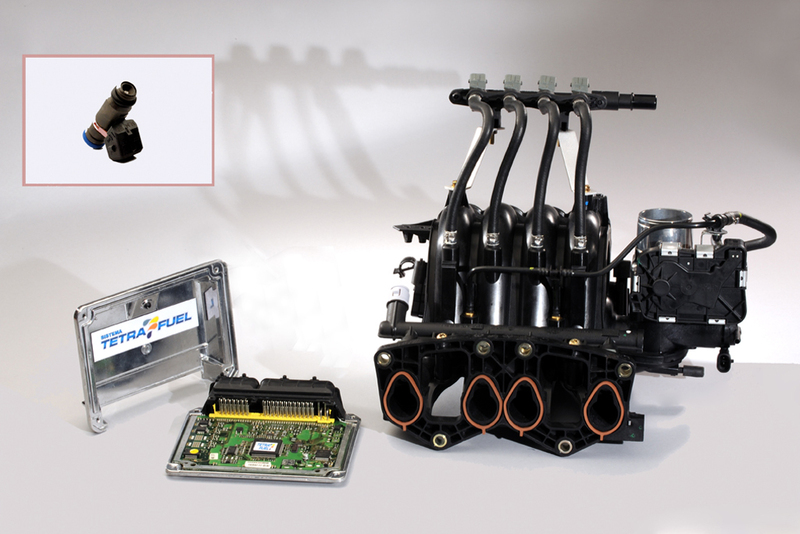 TetraFuel® technology is an offshoot of the Flexfuel SFS® (Software Flexfuel Sensor) system, which Magneti Marelli launched in 2003, again in Brazil. Flexfuel SFS® offers the possibility of using two fuels (petrol and alcohol), in various percentages (from 0 to 100%), also giving the consumer complete flexibility as regards refuelling and mobility, and allowing him to select the lower-priced fuel. The operating principle of the FlexFuel SFS® and TetraFuel® systems is electronic, and it does not rely on “physical” sensors for fuel analysis. The system is instead based on powerful calculation software (SFS Software Flexfuel Sensor) and on a 32-bit microprocessor housed in the ECU (Engine Control Unit). The microprocessor software accurately analyses the fuels contained in the fuel mixture present in the vehicle, using parameters and information received from fuel injection sensors (i.e. : lambda probe), engine temperature, speed, rotation and so on. The possibility of removing the expensive physical sensor which measures the fuel blend cuts the cost and complexity of the car, while improving its reliability.